Worldwide Brand Innovation Manager, HP Inc.
Simon works for HP Inc. as the Worldwide Brand Innovation Manager for Corrugated Solutions. Prior to this role he worked within HP Inc’s Graphic Solutions Business - WW Marketing Team. 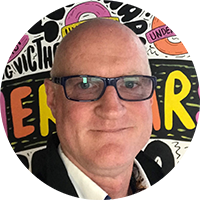 Travelling extensively, Simon engages brands & print service providers on the advantages and opportunities offered by digitally printing corrugated packaging and point of sale. To reach today’s consumers, it is more important than ever for brands to have a packaging personalization and customization strategy through the next 10 years. After carrying out extensive research throughout 2018 on these emerging audiences, HP will present their results and highlight the opportunities for those that embrace digital print as an enabler for growth.